However trekking gorillas in Uganda that starts from Entebbe or Kampala to Bwindi has its pros and cons. It is very good for visitors who have programmes to fullfill in Kampala or have other tours and safaris to do in other parts of Uganda. For instance, someone for gorilla tracking in Bwindi but has wildlife safaris in Queen Elizabeth, Lake Mburo, Kibale or Murchison Falls National park on the itinerary would better go through Entebbe. 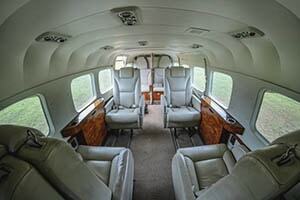 A gorilla trip by flying to Bwindi or Kisoro is only available by taking a flight from Entebbe to the gorilla parks and not possible from Kigali. In case you have only gorilla trekking in Uganda on a trip for one, two or three days, passing by Rwanda is more ideal. On the other hand, Uganda’s geographical beauty may best be exploited by a driving all the way from Entebbe /Kampala to Bwindi. There is alot to see alot the way including the Uganda Equator, parts of Lake Mburo National Park, Igongo Cultural Centre plus beatiful gardens, animals and people. These will not be enjoyed in a short distance from Kigali to Bwindi forest. 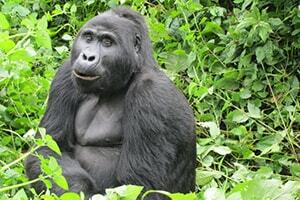 Take a 3 Days Gorilla Tour to Bwindi Impenetrable Forest. Seeing gorillas in Uganda is a lifetime experience. Take pleasure in a Gorilla Trekking safari to Mgahinga National Park, a second home to the Mountain Gorillas in Uganda. 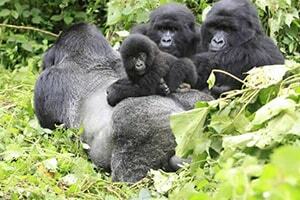 3 Days Uganda Gorilla Habituation Experience in Bwindi National Park. Enjoy gorilla habituation experience in Bwindi National Park by spending 4 hours with the endangered primates. 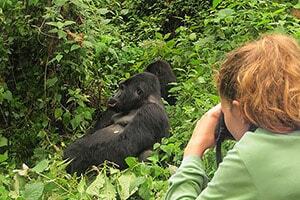 Enjoy a flight Entebbe Airport to Bwindi Forest or Kisoro near Mgahinga National Park for gorilla trekking adventure.